Hunter Shaw Fine Art presents LIGHTBRIDGE, an exhibition of recent mixed media paintings by Mara De Luca. 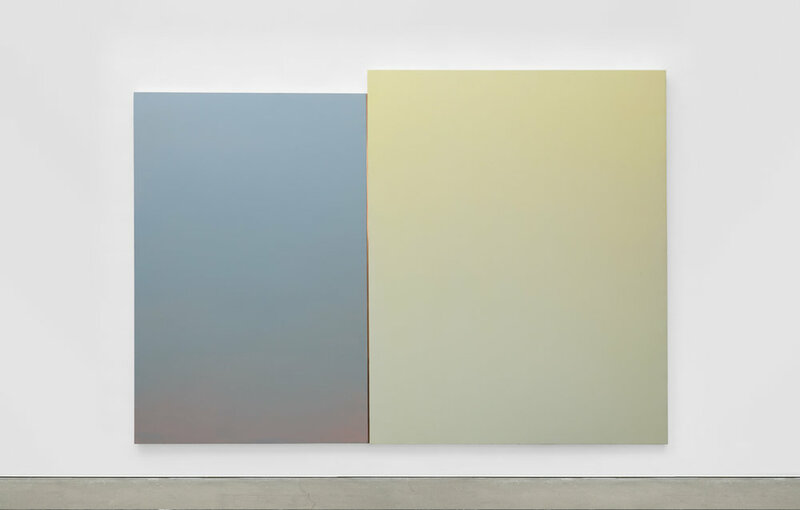 For the past decade De Luca has examined the aesthetic and conditional extremes of Los Angeles, investigating the city’s coexistent polarities through a considered approach to color, material, surface quality and imagery. Drawing upon cultural phenomena specific to the city such as billboard advertisement, self-improvement ideology and Hollywood, LIGHTBRIDGE articulates an “LA sublime,” in which a slick and attractive surface conceals an undercurrent of desire and unease. Hazy gradients and luminous monochromes suggest LA’s iconic skyspace at once overwhelmingly seductive and highly toxic. While directly interpreting the cultural and visual climate of the city, De Luca’s work engages with art historical developments specific to LA, such as Conceptualism, Light and Space, Finish Fetish and Feminism. Pleasing aesthetics coexist with ruptures, splices, color shifts and metal interferences, referencing the fractured nature of our constructed reality. Operating within the global lineage of light-obsessed painters from Caravaggio to Mary Corse, De Luca focuses on the spiritual and emotional qualities of illumination. Vast atmospheric planes are bisected by strips of gleaming metal, emblems of desire - enticing, fleeting and finite next to the expansive fields of light. Throughout LIGHTBRIDGE, De Luca adopts a macro view, revealing a kind of perfection in the totality: everything beautiful and horrible, spectacular and mundane, unfolding under the same confluence of sunlight and smog. Mara De Luca received a MFA from California Institute of the Arts, Valencia CA and a BA from Columbia University, Department of Visual Arts, New York NY. Recent solo exhibitions include Talisman, TOTAH, New York NY (2018); Lead Me Through the Dawn, Quint Projects, San Diego CA (2016); Driving Sunset, Edward Cella Art and Architecture, Los Angeles CA (2016); CRUISE COLLECTION 2013, Luis de Jesus, Los Angeles CA (2013); saltus fidei/ Leap of Faith, Luis de Jesus, Los Angeles CA (2011). Recent group exhibitions include Distant Light, Quint Projects, San Diego CA (2018); Cosmic Connections, TOTAH, New York NY (2016); Atmospheric Abstraction: Larry Bell, Gisela Colon, Mara De Luca and Heather Gwen Martin, Quint Gallery, La Jolla CA (2015).